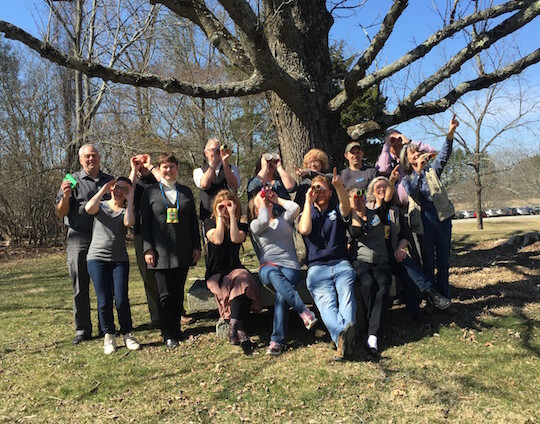 Posted on March 10, 2016 by Hillary T.
What are our Bird-a-thon Team Captains looking at? Bird-a-thon is Mass Audubon’s annual birding competition and our largest fundraiser. On May 13 and 14, 25 teams of birders will spend 24 hours attempting to spot the most species in Massachusetts all the while raising essential funds for our wildlife sanctuaries and programs. Seasoned birders, beginner birders, or those who just want to support a team by fundraising (Bird-a-thon Boosters) are all encouraged to participate. This year, we have set our fundraising goal at $250,000 to enable the continued protection of the nature of Massachusetts through conservation, education, and advocacy. Want to get in on the action? There are several ways to be a part of Bird-a-thon starting today! Bird and Fundraise for a Bird-a-thon Team: Fundraise for your team online by creating a fundraising page and/or raise money offline. If you are not yet signed up to bird on a team and would like to learn more, contact birdathon@massaudubon.org or 781-259-2136. Be a Bird-a-thon Booster (Fundraise for Bird-a-thon): Create a fundraising page to fundraise online for your team of choice and/or fundraise offline. This entry was posted in Get Involved and tagged bird-a-thon, birdathon on March 10, 2016 by Hillary T..